A bit earlier than previously anticipated, AMD announces the arrival of the Radeon HD 7970. This is the world's first 28nm GPU and it's also AMD's first card to use the new GCN architecture. The $549 product has 2048 stream processors, a 348-bit memory bus, 925MHz core and 3GB GDDR5 clocked at 5.5GHz. The Radeon HD 7970 consists of 4.31 billion transistors, almost 65 percent more than the Radeon HD 6970's 2.64 billion transistors. Reviews show AMD has once again retaken the single-GPU graphics card performance crown, at least until NVIDIA's Kepler GPU arrives in 2012. Retail availability of the Radeon HD 7970 isn't expected until January 9, 2012 though, which was the original launch date. AMD (NYSE: AMD) today launched the AMD Radeon™ HD 7970 graphics card for desktop PCs, introducing the world’s fastest single GPU graphics card and the only GPU based on 28nm production technology. 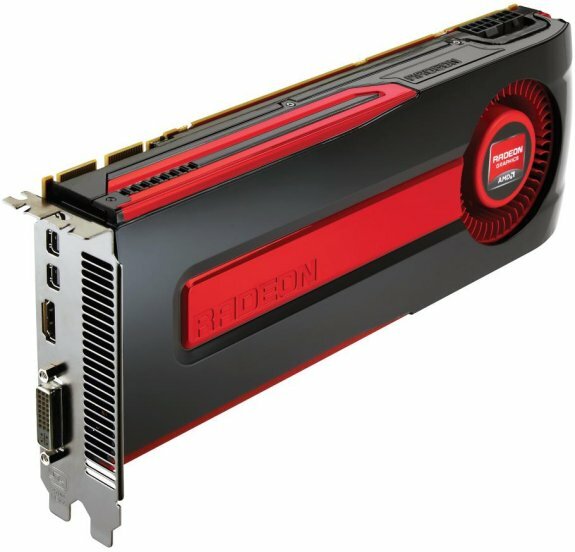 With the arrival of the AMD Radeon HD 7970, AMD has unleashed its revolutionary new Graphics Core Next Architecture that enables new levels of gaming and compute capabilities – realizing an improvement of over 150% in performance/sq mm over the prior generation. Engineered with support for PCI Express 3.0 and AMD CrossFire™ technology, the AMD Radeon HD 7970 graphics card arrives prepared for the next level of gaming. AMD further extends its GPU leadership with the AMD Radeon HD 7970 through AMD App Acceleration, which enables exquisite high-definition video images and exceptional performance improvements for everyday applications. Ground-breaking advancements with AMD Eyefinity technology enable gamers and desktop enthusiasts to connect up to six displays to one graphics card, delivering immersive stereoscopic 3D experiences and astonishing 16k x 16k display resolutions. It’s also armed with the latest PCI Express 3.0 standard to enable uncompromised image quality, and is additionally equipped with GDDR5 memory, enabling accelerated GPU performance. Through its intelligent AMD PowerTune and AMD ZeroCore Power technologies, the AMD Radeon HD 7970 enables higher performance levels while maximizing power efficiencies. Next Generation AMD Eyefinity technology: AMD Eyefinity 2.0 features all-new support for stereo 3D, universal bezel compensation, brand new display configurations and an expanded and more immersive field of view. This allows users with 2560x1600 monitors in an AMD Eyefinity 5x1 landscape configuration to achieve a horizontal resolution of 12,800 pixels, driving more than 20 million pixels of screen real estate. Eyefinity-ready, and hundreds more are AMD Eyefinity-compatible.